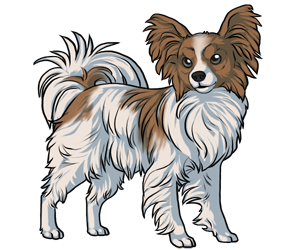 The papillon is a very old breed of dog that can be dated back more than 700 years in Europe. They were shown in paintings to sit upon the laps of French and Spanish noblewomen. Before they were named Papillons, they were called "dwarf spaniel". Today the breed makes for a wonderful pet and can do well in apartments due to their small sizes. The papillon is often reffered to as "butterfly" due to the position of its ears. Two types of Papillons can be born in a single littler- Papillons with erect ears or "Phalenes" who have floppy ears.